Click on the bars below to all the subdivisions and condo & townhome complexes in Lakewood. You can also view the most popular searches such as ranch style homes, new construction, homes with a pool or houses with mountain views. Click to see Local Subdivision and Complex Maps. Lakewood CO is a jewel among the West Metro towns sitting west of Denver, nestled between I-70 to the West and I-25 to the East, bordering Morrison to the South and Wheat Ridge to the North. As the most populous city in Jefferson County, Lakewood is a rich mix of bustling community spirit and rugged Colorado nature. Home options in the city range from mountain retreats, townhouses, condominiums, golf club communities, and more. Homes for Sale in Lakewood include gated communities like Country Manor. A new master-planned community, Green Gables Reserve, features single-family homes, townhomes, and patio homes. Solterra, another master-planned community, is nestled in the foothills for spectacular views. There are many available Lakewood homes for sale in golf communities, such as Bear Creek Village set amongst three golf courses. For a more urban approach, numerous townhouse and condo complexes are available such as Dakota Terrace Townhomes and Edgewater Park. Homes for sale in Lakewood CO are also welcoming to our equine friends, such as Bear Creek Ranchette. Affordable Lakewood real estate for families and first-time buyers are located in places like Greenbrier and Academy Pointe. Culture and community are an important part of life in Lakewood, with events occurring year-round. Think theater, sports, Farmers Market, local artists, and enticing music and dining options. Golf aficionados are catered for in Lakewood and should check out Fox Hollow Golf Course, Bear Creek Golf Club, and The Homestead Golf Course. Lakewood Homes for Sale are surrounded by the beauty of Colorado, providing a treasure trove of mountain parks, trails, and outdoor activities. Bear Creek Lake Regional Park, and the enormous William F Hayden Green Mountain Park are notable spaces that provide trails, archery, horseback riding, dog paths, and simply beautiful places to relax. Lakewood is a year-round gem and transforms in the winter into a hub for ice skating, snowshoeing, skiing, and ice fishing. Due to its close proximity to downtown Denver along the I-70, Lakewood has access to leading ski resorts and Denver’s big-city attractions. Families are also drawn to the Lakewood Colorado Real Estate market because of its highly rated schools, sought after by parents across Jefferson County.See a complete list of attractions and Things To Do in Lakewood. Our Lakewood Real Estate agent will show you all the attractions this beautiful city has available. We can give you a comprehensive look at active homes in Lakewood CO, including all open subdivisions, and an interactive community map. Interested customers can receive a Free Personalized Market Report to help them learn more about Real Estate Market Trends. This report allows you to see how the market is currently operating and expected trends, whether you are buying or selling. Call us at 303-325-5690 to talk to our Lakewood Real Estate Agent for all your information on homes for sale in the community. 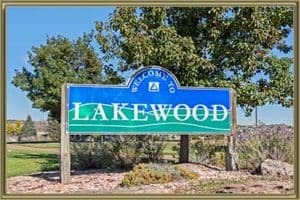 If you are selling a home in Lakewood Colorado, receive your Lakewood Home Value Instantly Online and speak to a local agent about Lakewood CO Home Values. Our agents are specialists who provide expert advice for pre-listing and detailed home valuations. We can also give a free staging consultation for any listing. Through our advanced online search engine, you can see homes sold and under contract in your area. Our Lakewood local market trend reports are worth reading and are available below. We update regularly to ensure area appreciation and average sold prices stay current. Mike Lies and the Gold Compass Real Estate team is your go-to real estate agent for Lakewood CO, and we can help whether you want to know about prices in the West Metro area or are ready to make the jump to selling or buying a property. As professional realtors, the team at Gold Compass Real Estate is expertly equipped to meet your needs. Our home guidance services are perfected to deliver a service you can trust! Gold Compass Real Estate is a specialist in local real estate, including Lakewood homes for sale and properties across the West Metro region. Listings for Lakewood CO are available directly on our website, while you can also browse all Denver Metro listings. You can schedule a tour of Lakewood Homes For Sale or request our full market analysis by calling Gold Compass Real Estate at 303-325-5690.